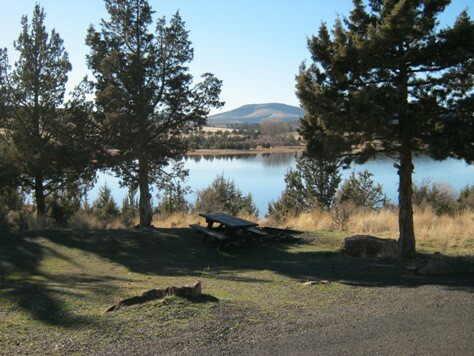 Haystack reservoir is one of the premier campgrounds in the scenic high desert of the Crooked River National Grasslands. And it also offers the most amenities to visitors to this area. It is located on the eastern shore of Haystack Reservoir and is surrounded by native vegetation including sagebrush. It also has juniper trees, and you can catch glimpses of the beautiful Three Sisters in the distance. Then on the hot summer days, you can cool off in the water of the reservoir. By the way, if you’re getting hungry you might cast a line and you may get a bite and catch dinner. There are also nearby trails to accommodate for all of you hikers and mountain bikers as well. Whatever your pleasure might be on the grasslands, Haystack Reservoir is a great place to camp. Also, see the Haystack West Shore Campground and Day Use Area and the Haystack South Shore Group Campground. There will be more information on those later. Here are some things to know. Reservations can be made up to 6 months in advance, but not less than 1 day in advance. 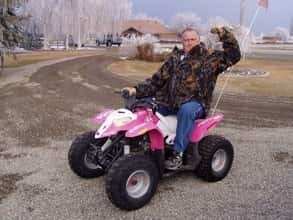 If you would like to make a reservation you can call 1-877-444-6777 or visit http://www.recreation.gov. Haystack Reservoir is a popular fishing spot for a variety of species, including kokanee, rainbow trout, largemouth bass, black crappie, and brown bullhead catfish. 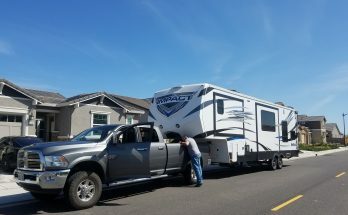 Camping fees are for each site per night they are $15.00 for first vehicle and $6.00 for each additional vehicle. There is also a day use fee: of $5 per vehicle or group. Camping: They do offer a 50% discount for single site camping only with any of these passes: Interagency Senior, Interagency Access, Golden Age, or Golden Access. Campground camping there are 24 standard campsites. 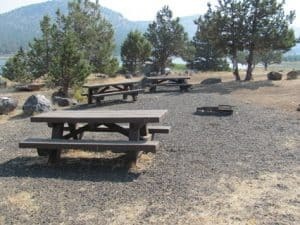 There are one wooden picnic table and one combination fire ring/grill per campsite. 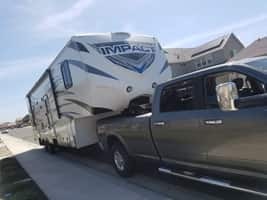 There is also an onsite campground host. They also have two horseshoe pits that are available. RV parking is available up to 32 feet, and there is a water filling station but no hookups or dumping facilities. 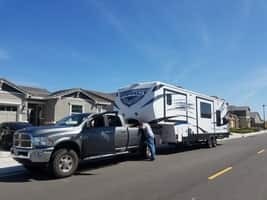 This campground is about the same as the day use area as far as the fees go. But there are a few different things at this location. They have five shaded pavilions with 12 wooden picnic tables. There also have some water activities here. They have one combination of swimming and fishing beach but there is no lifeguard on duty, so swim at your own risk. 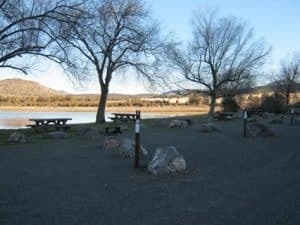 The South Shore Group Campground is the only group campground on Haystack reservoir. This facility only has two group campsites, each of which holds around 75 people. This makes it ideal for large events such as family reunions, or groups of rock climbers. That might want to visit the nearby Smith Rock State Park, best known for its many rock climbing routes, is a short drive away. This campground operates through reservations only and reservations are accepted in Spring, Summer and Fall months. But they do not take them more than 6 months in advance. You might want to keep this venue in mind for your next outdoor event.